From L-R: Chris Klafs, Pr. Tom Unrath, Pr. Kit Robison, Steve and Leandra Rizzo, Marcee Strickland. On April 24, six members of the Florida-Bahamas Synod Suriname-Guyana Subcommittee departed airports in Miami and Orlando to attend the 74th annual convention of the Evangelical Lutheran Church in Guyana (ELCG). 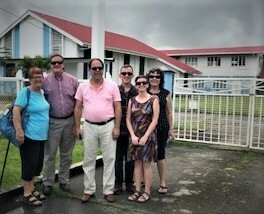 However, the team’s first stop would be the country of Suriname, where our delegation was invited to first visit the Evangelisch Lutherse Kerk Suriname (ELKS, or Evangelical Lutheran Church in Suriname). The team included subcommittee chair Rev. Tom Unrath, Rev. Kit Robison, Marcee Strickland, Chris Klafs, and Steve and Leandra Rizzo. It was a bittersweet trip for Rev. Unrath, who has for the past ten years served as chair of the Suriname-Guyana subcommittee. Rev. Unrath would be making his last trip to Suriname and Guyana due to health reasons, so Rev. Robison was being introduced to his new role as chair. It was the first trip to the two countries for Rev. Robison, who leads a congregation in Miami Springs and formerly served a Lutheran church in Quito, Ecuador. Much of the discussion among ELKS and the Synod delegation revolved around the language of an Memorandum of Understanding (MOU/I). The basic objective of the document is “to facilitate cooperation and coordination to accomplish the common mission and vision of all parties.” Our discussions led to some proposals for mutually agreeable changes. These largely concerned making it a more level agreement with shared responsibilities among all three parties, rather than discrete and individual responsibilities for each church body as in the original agreement. Everywhere we went, we were treated to incredible hospitality. We certainly never went hungry, thanks to the frequent meals of various cultural stripes. For those returning to Suriname, old friendships were affirmed, while for those visiting for the first time, many new friendships were kindled. In the meeting with the ELCG board, the Guyanese church discussed its hopes, expectations, and priorities for working with its companion churches. Their board laid out three main objectives for working with companion churches: addressing communications concerns, revising the MOU/I, and development of the Lay Academy and Guyana Lutheran Music Academy. Once again, we were treated to incredible hospitality and accompaniment. Rev. Unrath was recognized for his years of friendship and service, and Rev. Robison was welcomed as the new chair. “Sister Chris” affirmed many old and close friendships, Marcee affirmed many friends she had met through women’s ministry events, and newcomers Steve and Leandra made many new friends. We spent a final few days resting and sightseeing in Georgetown, the capital of Guyana, before bidding adieu to South America on May 5. If I may speak for the whole Florida-Bahamas Synod delegation, I know that we all went home feeling very close as a team and very blessed to have travelled together. We felt blessed to have made so many wonderful friends and to have taken these steps in a positive, vibrant walk of accompaniment with our companion churches. We are all excited to continue working with our companion churches in Guyana and Suriname, and with each other. I pray that God continues to bless us and guide us as we continue our work in the name of Christ.